IN THEIR MATCHING RED JUMPSUITS, Sir Paul McCartney and his then-wife Heather Mills took to the sunny ice floes off Prince Edward Island last spring to loll with seal pups. They posed on their bellies for a scrum of photographers, just centimetres from a button-eyed baby. In his thick Liverpool brogue, McCartney pleaded before the cameras: “Unless something’s done about it, he’s going to be clubbed to death in the next few weeks.” Canada’s annual seal harvest was around the corner, and the U.S. Humane Society’s star-studded contingent had arrived early to drum up publicity for what it calls a cruel and unnecessary slaughter. When Sheila Watt-Cloutier caught the McCartney footage that evening in a U.S. hotel room, she cringed. The renowned Inuit leader and activist had been on the road, busy campaigning and raising alarm about climate change. The stunt only added to her worries; bad press for the East Coast harvest had historically spelled trouble for Inuit sealers, whose meagre commercial hunt hinges on the same market. A few months after the McCartney foray, the anti-sealing machine gathered momentum in Europe. By September, a record number of European Union parliamentarians had signed a declaration calling for an import-ban on all seal products. Belgium soon followed with its own embargo, and Germany and Italy weren’t far behind. As pressure mounts in Europe, and a new roster of pop idols returns to the floes to deplore Canada’s centuries-old hunt, Inuit sealers can only hope they don’t get pinned in the crossfire, as they did so tragically two decades ago. Celebrities showing up on Canada’s eastern ice floes. Activists handcuffed themselves to towlines and, on the floes, gathered gruesome footage of villagers clubbing, hurling and skinning seals amid red snow and carcasses. For the first time in hundreds of years, Canada’s seal hunt was making the news – particularly in Europe, where the fur market was hot. Meanwhile, the U.S.-based International Fund for Animal Welfare was filling up petitions and buying full-page ads in European newspapers, urging citizens to lobby their parliament for a seal ban. The pressure paid off. 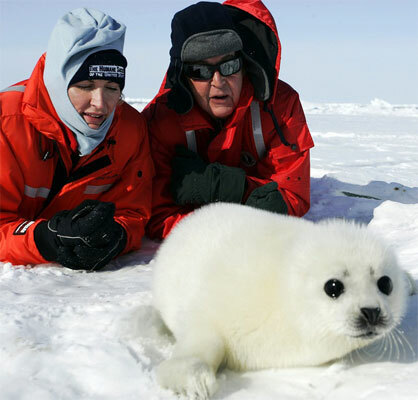 In 1983 the European Community enacted an import-ban, which – to the initial disappointment of anti-sealers – only blocked fur from defenceless babies: harp seals less than 12 days old (whitecoats) and hooded seals under one year (bluebacks). Though the directive targeted a narrow category of seals, the impacts were wide-ranging nonetheless. Thousands of kilometres north in the NWT and present-day Nunavut, Inuit sealers didn’t know Brigitte Bardot. Nor were they familiar with whitecoats, which are foreign to Arctic waters. But they did know seals. For milennia, they’ve depended on the North’s most common pinnipeds, ringed and bearded seals, whose ample blubber and waterproof skins made Arctic habitation possible. Even after the rise of the fur-trade, Inuit sealing remained a purely subsistence pursuit. Then, in the early 1960s, Norwegians figured out how to tan skins. Suddenly, a commercial fur-garment market flourished, and trading posts scattered across the North started offering Inuit top dollar for their pelts. 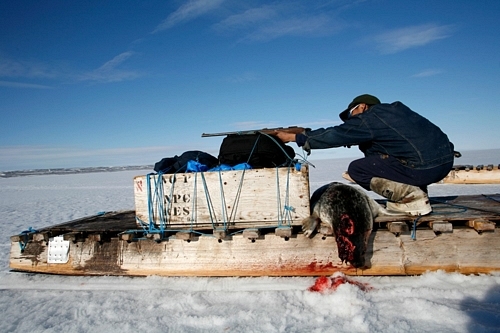 By the 1970s, shooting seals had become the foremost way for Canadian Inuit to earn hard currency. Though the fat and meat were still used like in old times, the pelts now produced money and Inuit joined the global economy. Now they could buy rifles and snowmobiles, and household luxuries which other North Americans had long taken for granted. But soon after Bardot’s escapades offshore of the Maritime Provinces, the North’s sealskin lifeline began to fray. Inuit hunters were mystified to suddenly receive less than $12 for a pelt that had earned them twice as much the year before. Then, in 1983, when the European baby-seal ban hit, pelt prices dropped again, to $9. The market was effectively dead. Perhaps surprisingly, the Inuit seal industry dissolved despite being explicitly exempted from the European fur ban. “People thought Inuit would get more money for pelts because they’d be the only ones hunting,” remembers Herscovici. “But it turned out to be totally useless.” The inevitable domino crash of the world market left Inuit blindsided and broke. Territorial seal-pelt earnings – which had stood at almost $1-million in 1980 – nosedived to under $77,000 in 1983. By 1987, sales sunk to just $18,000. “It affected us real bad,” recalls Jooeelee Papatsie, a lifelong sealer based in the Baffin Island hamlet of Pangnirtung. There, in the village of 1,200, total sealing income fell from $200,000 in 1981-82 to $42,000 in 1983-84. Welfare payments increased 183 percent. Papatsie was lucky; he was one of the few who spoke some English, and could make extra money guiding scientists and eco-adventure types around Cumberland Sound. He also took the occasional construction job and eventually landed a full-time maintenance contract at the hamlet office. Others weren’t as fortunate. Scarce employment drove many to Iqaluit, where wage-work opportunities were only slightly better. And the scene elsewhere in the North was similar. Generally, social-assistance payments soared, because many couldn’t afford to hunt commercially anymore. Some focused on char fishing, which didn’t require ammo or gas, and hunted the odd seal for their family, as they had before skins became a commodity. Just as the cash economy had introduced a dependency on new goods, its sudden disappearance created an unprecedented rift. Inuit were experiencing their first economic slump, and some say when the seal market fell, so did Inuit. Though unsubstantiated, much research on the seal-collapse aftermath alludes to an alarming spike in suicide, delinquency and general despair. Today, some two decades after the market collapse, seal-pelt prices have slowly crawled back to record-high levels, thanks largely to new Chinese and Russian markets and the whims of the fashion world. Despite the latest rash of anti-sealing antics, demand has been stronger than ever. At last year’s Fur Harvesters Auction in North Bay, Ontario pelts went for a high average of $69, with the top skin earning $121. “It’s an industrial-scale slaughter that occurs over a few days far offshore on unstable sea ice and in often extreme weather conditions,” says Rebecca Aldworth, the society’s Canadian director and a tearfully passionate Newfoundlander. Aldworth says that monitoring, though legally mandated, is barely conducted, and worries harvesters don’t always ensure animals are dead before skinning them. So they don’t damage the pelts with bullet holes, Maritime hunters usually bludgeon their prey with a spiked club called a hakapik. They immediately skin the seals on the ice, and back at the docks, pelts are tossed in a vat of brine to be shipped to Norway for processing. “All this to make fur coats that nobody needs,” Aldworth adds. Her unwavering decade-long fight to end the seal hunt follows the Greenpeace and IFAW aim of the 1970s: to topple the European market. Shortly after the McCartney stunt, Aldworth brought Sweden’s European parliamentarian, Carl Schlyter, along on her annual spring trip to the bloody ice floes. Soon thereafter, Schlyter and fellow MEP Caroline Lucas drafted the seal-ban declaration, which by September was signed by more than half of the parliament. Expanding on the 1983 baby-seal legislation, the new proposed ban targetted all seals of all ages. But while the declaration’s demands are severe, its architects say they’re cognizant of the Inuit factor. Just as European politicians had predicted prior to the 1983 crash, Aldworth and Lucas forecast a sunny outcome for Inuit sealers. “If the commercial seal hunt collapses, the market will be guaranteed for Inuit because people will know they’re not buying East Coast skins,” Aldworth says. In January, the European Commission president released his long-awaited response to parliament’s seal-ban proposal. He decided not to pursue a total ban, opting instead to base further judgments on an EU-sponsored study into the humaneness of the hunt. Canada’s Eastern and Northern fisheries ministers breathed a sigh of relief, though short-lived. A few days after the president’s decision, Belgium announced its own embargo, and became the first EU country to ban all seal products. With similar proposals churning in the German, Italian and Dutch parliaments, more bans are sure to follow. Meanwhile, Rebecca Aldworth continues ferrying celebrities, journalists and European parliamentarians to the East Coast to watch the blood flow, and hearts swell.